Lima Central Catholic’s Shaun Thomas looks to shake Covington’s Josh Latimer during Friday night’s Division VI, Region 24 playoff game at Spartan Stadium. Lima Central Catholic’s Rossi Moore tries to prevnet a tackle by Covington’s Dalton Weer during Friday night’s Division VI, Region 24 playoff game at Spartan Stadium. LIMA — Lima Central Catholic found out in a hurry that it had way too much speed and quickness for Covington. 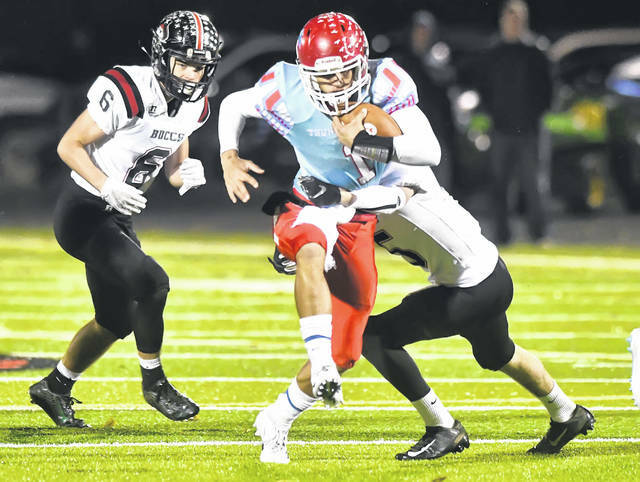 The T-Birds ran nearly at will around the corners in a 40-18 LCC victory against Covington in the opening round of the Division VI football playoffs Friday at Spartan Stadium. Lima Central Catholic (9-1) advances to the Division VI, Region 24 semifinals against Marion Local at 7 p.m. Friday at a site to be named. Covington ended its season 7-4. 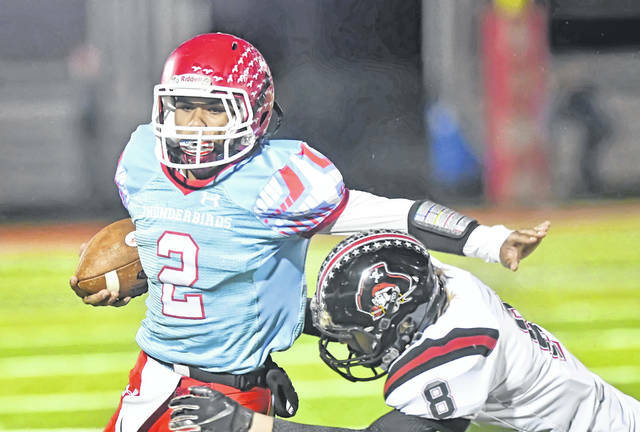 The victory helped erase a Week 10 loss to Lucas, which spoiled an unbeaten regular season. LCC’s offensive line of center Zac Jacobs, guards Austin Campbell and Keegan Zupan and tackles Ethan Truex and Micah Pearson continually blew holes in the Covington line. LCC running back Shaun Thomas did a little of everything for the T-Birds. On the ground, Thomas had 13 carries for 102 yards and two TDs. He had TD runs of 11 and 19 yards. Thomas added four catches for 81 yards, with a 36-yard TD reception. “I had great blocks, but once we got to the edge, we were gone from there,” Thomas said. And on defense, Thomas had two interceptions, including one in the end zone in the final minutes. Banks also had a huge impact. On the ground, Banks had 18 carries for a game-high 137 yards. He had TD runs of 3 and 13 yards. Banks also had a 47-yard fumble return for a TD. To cap off the running game, Rossi Moore had 14 carries for 104 yards. That gave the T-Birds 356 yards rushing on the night. LCC quarterback Nevan Stolly completed 7 of 8 for 114 yards with one TD. Covington countered with a strong-arm, accurate-throwing quarterback in Cade Schmelzer. He completed 24 of 42 for 349 yards. He threw three TDs and had two interceptions. His top target was Andrew Cates, who had nine catches for 203 yards. He had TD receptions of 28, 45 and 49 yards. The T-Birds’ speed was way too much for the Buccaneers. LCC scored the first two times it touched the ball and went out to a 14-0 first-quarter lead. The T-Birds pushed the lead to 34-12 at the half. LCC needed only five plays to score first. Thomas turned the right corner for an 11-yard TD and the T-Birds led 7-0 with 10:38 left in the first quarter. LCC then took over at the Buccaneers’ 35. This time it took the T-Birds five plays to score. Again Thomas took the handoff on the jet sweep and went around the right side for a 19-yard TD. No one touched Thomas, as the LCC lead grew to 14-0 with 7:15 left in the first quarter. The T-Birds’ defense then got in on the scoring. Covington quarterback Schmelzer tried a pass backwards for a lateral to his wide receiver. But the ball bounced on the turf. Banks gobbled up the loose ball and it took 47 yards for the touchdown. “That was a big play for us,” Palte said. That gave LCC a 21-0 lead with 10:04 before halftime. LCC then went six plays over 56 yards for a score. The big play was a slant pass from Stolly to Thomas, who took in the pass with one hand for a 21-yard gain to the Covington 8. Two plays later, Banks ran over from the 3-yard line. That pushed the LCC lead to 27-0 with 6:04 left in the second quarter. Banks’ 13-yard TD gave LCC a 27-6 lead. The Buccaneers scored on the final play of the half on a 45-yard toss to the end zone from Schmelzer to Cates. That made it 34-12 at the half. This entry was tagged limacentralcoverage. Bookmark the permalink.